Posted on Wed, Mar 21, 2012 : 6:59 p.m.
Clockwise from left: Ypsilanti High School students Chenah Wiliams, senior; and juniors Brittany LeFlouria, Fatou Conde and Brianna Johnson. Chenah studies a list of chemicals that are in cigarettes. Ypsilanti High School junior Nate Barnes said he was impressed with all the students at his school Wednesday that seem to be against smoking cigarettes. Barnes said he was a smoker until recently, when he realized “it’s all negatives” and has no plans to start again, especially after Wednesday’s Kick Butts Day, a nation-wide initiative where students help educate each other about the dangers of tobacco use. YHS students in Adam Trumpour’s Community Leadership class ran the daylong event. 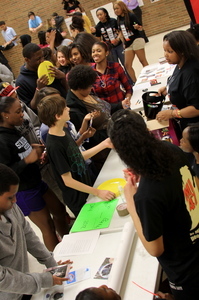 During the lunch periods, they hosted skits, an anti-tobacco rap, and set up several education stations with facts about tobacco. 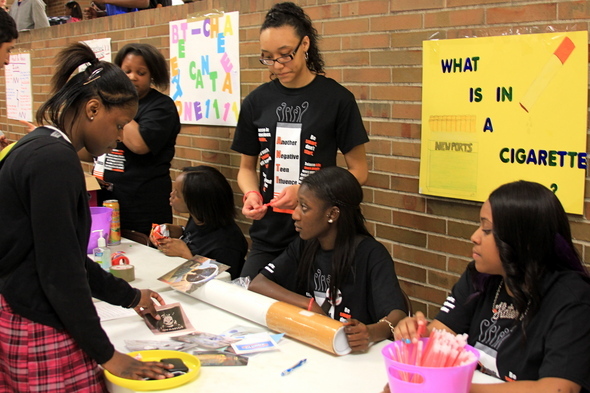 Ypsilanti High School students gather at tobacco education stations. The U.S. surgeon general’s new report on teen smoking, released last week, might reflect that teen smoking truly is “less cool” than before. In a 2011 survey of high school seniors, 18.7 percent reported to be smokers - down from 35 percent in 1997, according to the report. One group of students, led by senior Fabian Scott, wrote and performed an anti-tobacco rap in front of their fellow students. Scott said he had a blast performing and educating his friends about smoking. Scott said his favorite verse in his rap has to do with cigarillos, a narrow, cigarette-shaped cigar, which he said a lot of people smoke in the Ypsilanti area. The more than 800 YHS students witnessed the rap and visited the educational booths, Trumpour said. One booth asked students to do as many push-ups as they can, then subtract as much as 75 percent from that number if they are a smoker. Another booth had students guess what dangerous chemicals are in a cigarette, such as bleach and cyanide. A student-made video showcased pictures of lung, mouth and throat cancer victims and pictures of smokers' lungs and mouths compared with healthy lungs and mouths. "Smoking was part of a society a generation ago," Trumpour said. "But the laws, prices, pressure from peers helped keep it from being as big in this generation. Today, it's a very rare issue. It's still just as important, but more rare." Kick Butts Day was put on by YHS students with the help of Emily Preston Rahim, youth tobacco specialist in Washtenaw and Livingston counties through Karen Bergbower & Associates. Rahim said the students had been working on Kick Butts Day presentations and booths for more than a month. “It gives students the opportunity to learn about the harms of tobacco in different ways,” Rahim said. For junior Brittany LeFlouria, the knowledge of harmful tobacco use transcends herself and into her family. She said her great-grandmother died from complications from smoking, and she would love to see her grandma quit soon. "She smokes less now, but hasn't quit," LeFlouria said. "I'm going to tell her all the things I've been learning and hopefully help her quit." Rahim said in honor of the effort by YHS students and Kick Butts Day, she will be offering help to people trying to quit like LeFlouria's grandmother. Starting on April 24, Rahim is hosing a free, six-week tobacco treatment program for YHS parents or guardians. "One of the keys to helping prevent teen smoking is to help stop role-modeling that behavior," Rahim said. "We will talk about the physical, psychological and social aspects of smoking and in the fourth week, we will quit as a group." For more information regarding the free program and how to sign up, contact Emily Preston Rahim at 313-799-2467. Below, check out the the video of the Kick Butts Day Rap performed by Fabia Scott, Shelia Hollingsworth, Aysha Graham, Anthony LeFlouria and Winstecia Thomas. Thu, Mar 22, 2012 : 1:11 a.m.